The Minion Movie is coming and our kids can’t wait for us to get tickets through Fandango to see it in theaters . 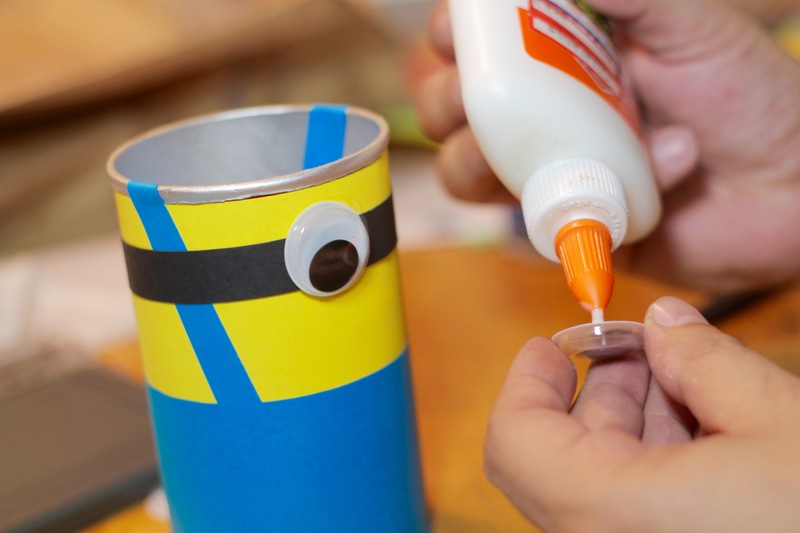 In preparation for the movie we wanted to come up with an easy and fun DIY Minion craft, and that’s when we came up with this easy DIY Minion Coin Bank! Since Minions work for an evil boss, they surely will need a place to hold their loot. 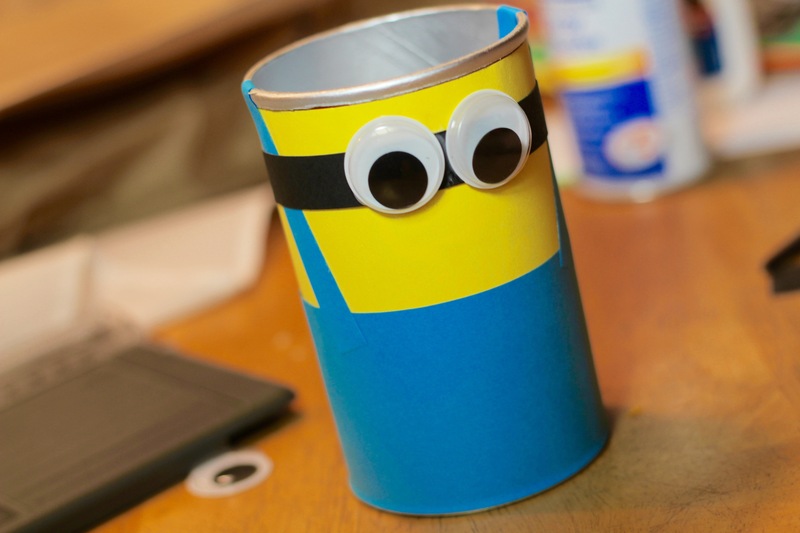 Using just a Pringles can, construction paper, and some google eyes you can make a Minion bank of your very own! 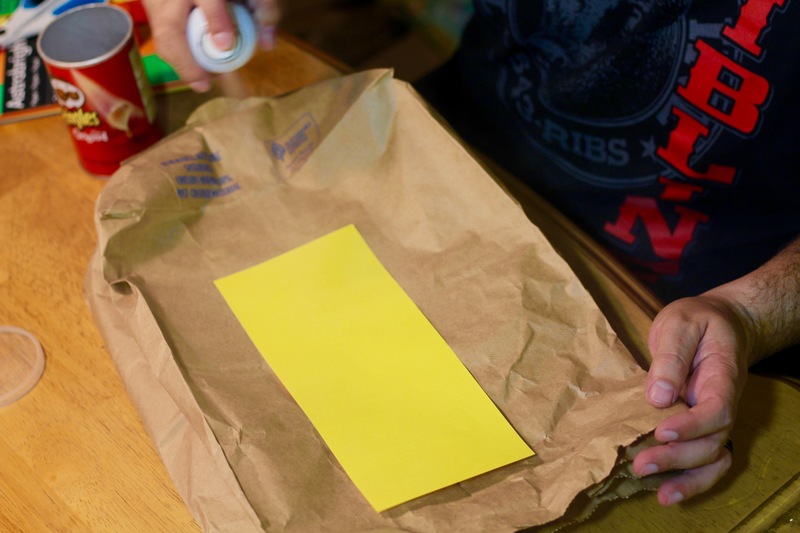 The first thing you’ll want to do is pull out a piece of yellow construction paper. 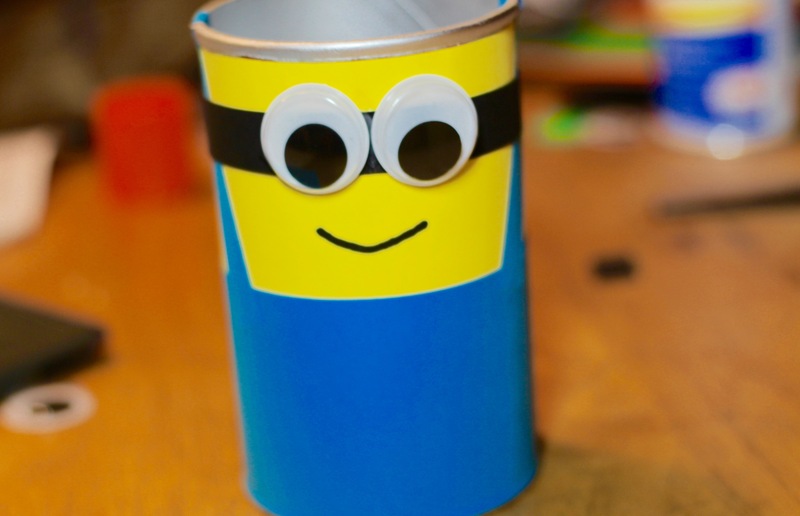 This will be for the Minion’s body. 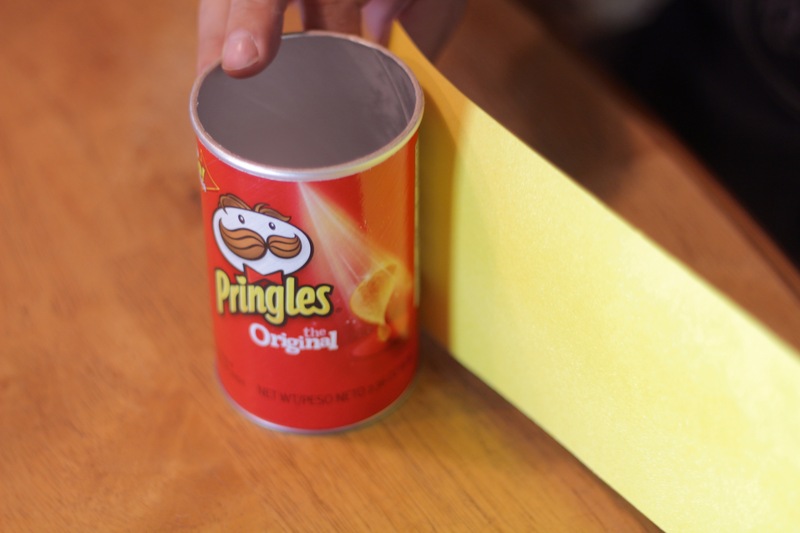 Wrap the yellow construction paper around the Pringles can. 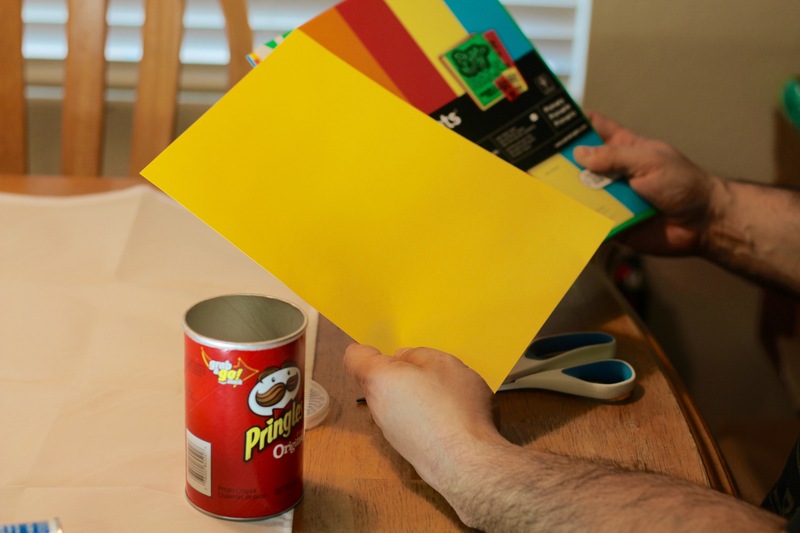 Cut off the excess portion of the yellow construction paper (that part that is above the top of the Pringles can). 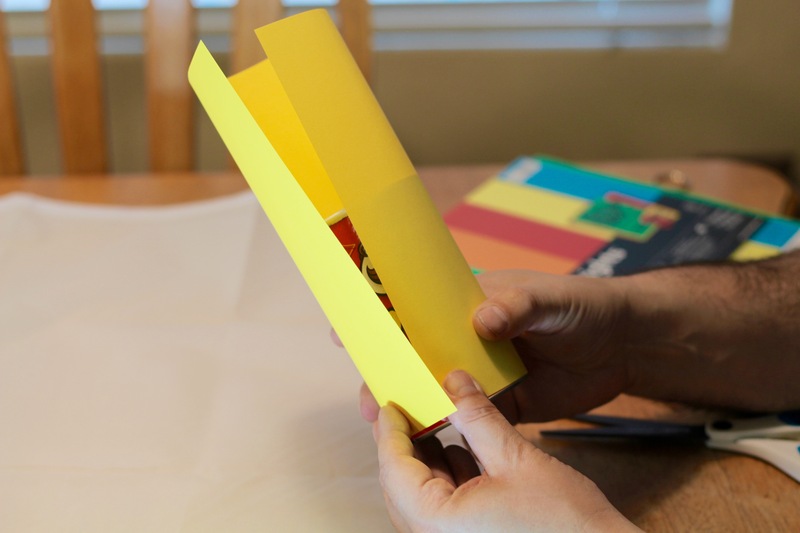 Using a trimmer (or scissors), clean up the edges of the construction paper. 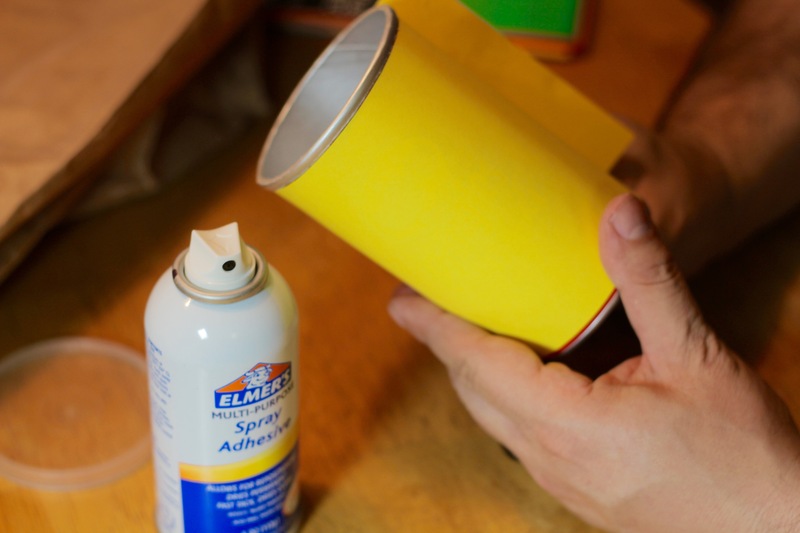 Using Elmer’s Spray Adhesive (or Elmer’s White Glue), cover the back of the construction paper. 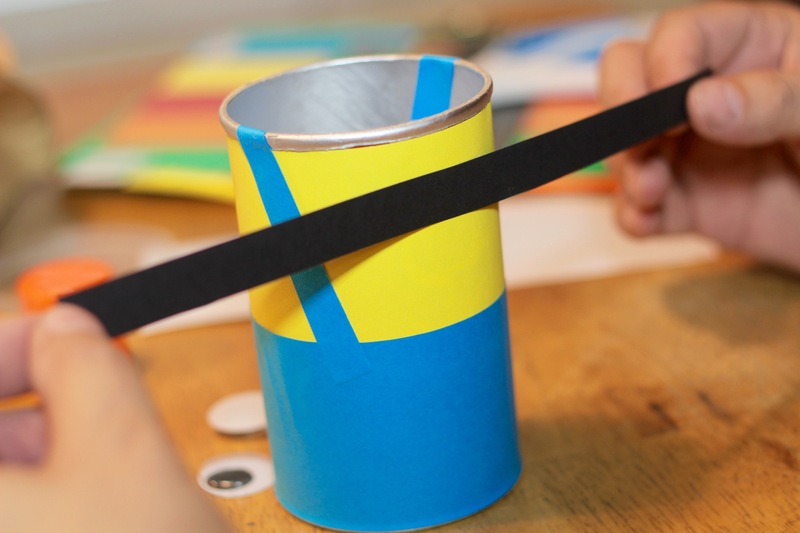 Place the glue-covered construction paper on the Pringles can. 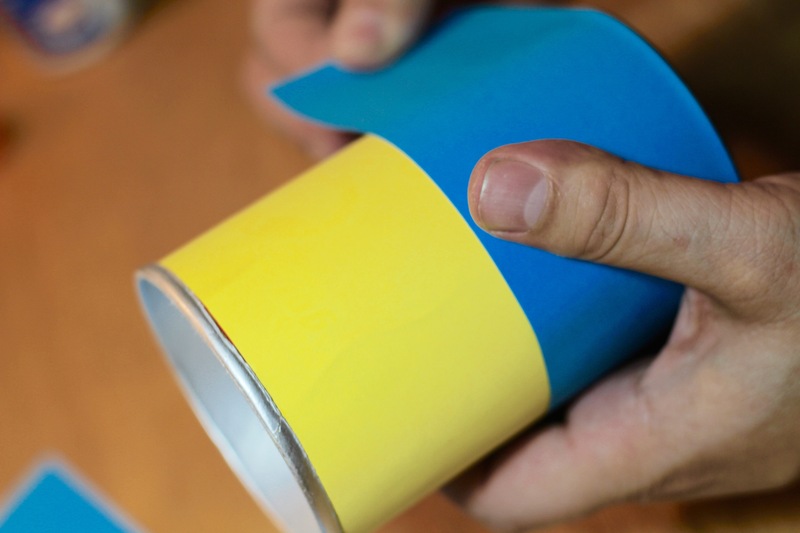 Wrap around and smooth the construction paper around the Pringles can. 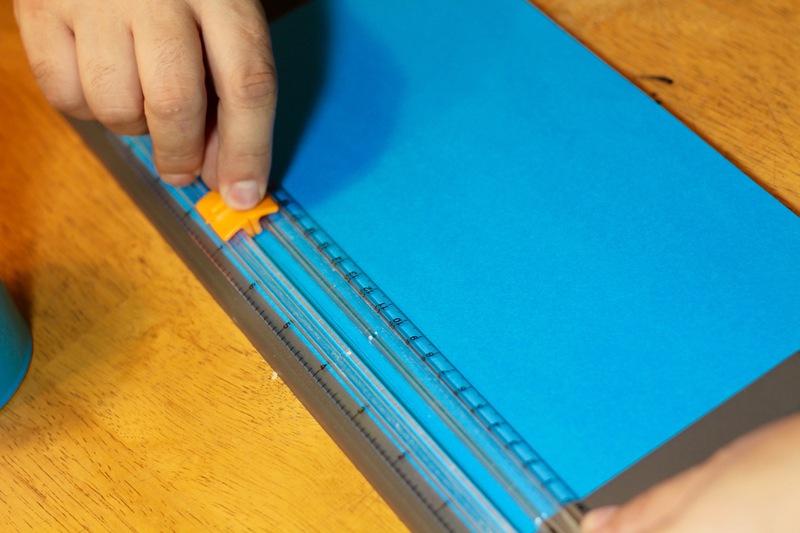 Next, you’ll be cutting the blue paper to make pants for little Minion. 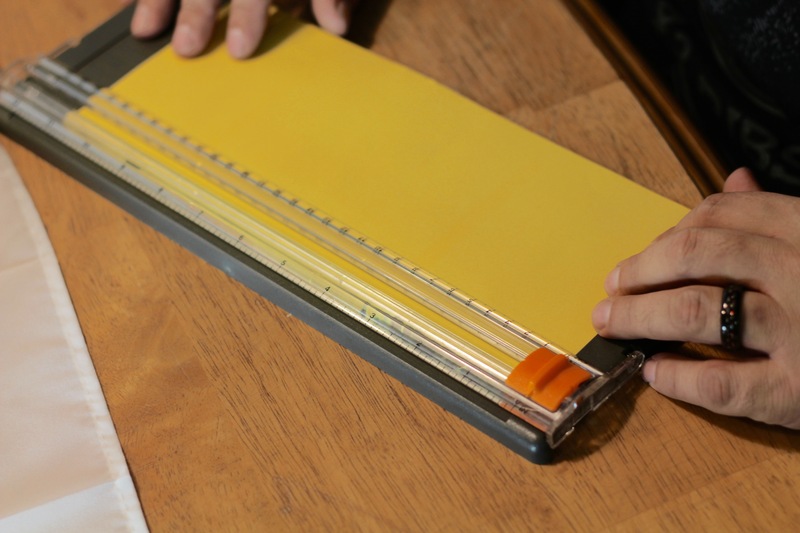 Use a trimmer or scissors to do this. 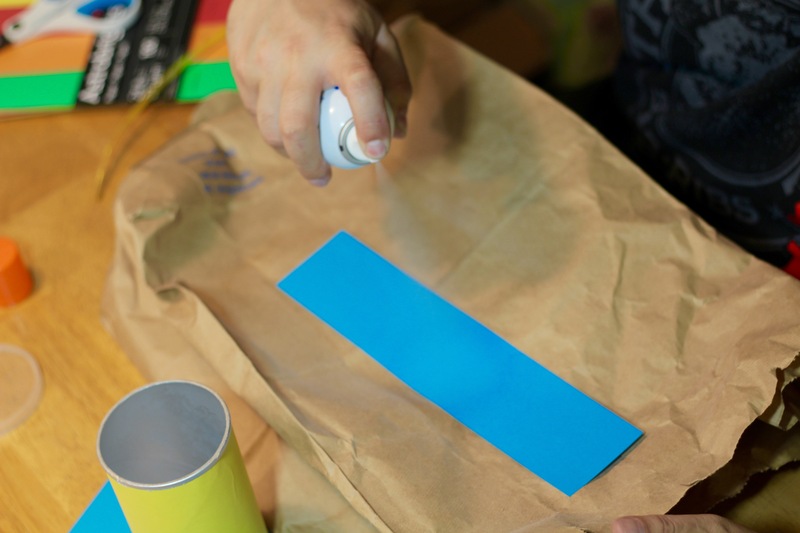 Spray the blue construction with Elmer’s Spray Adhesive (or use Elmer’s White Glue). 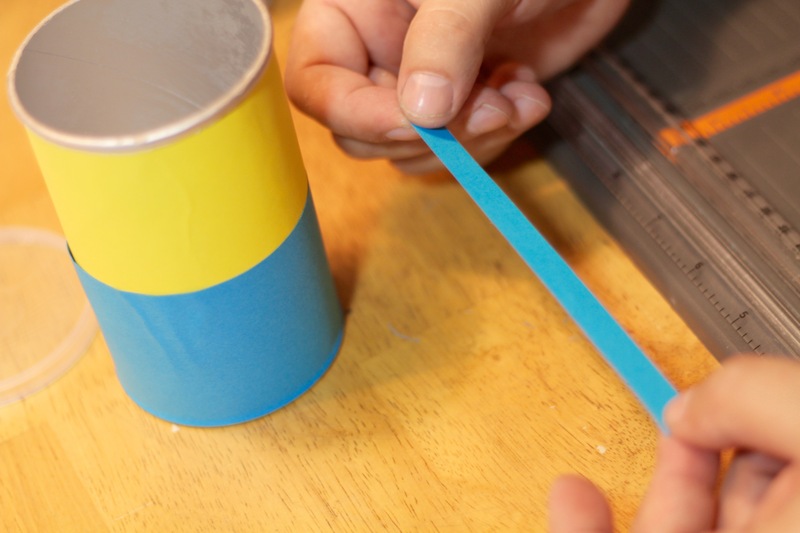 Wrap the glue-covered blue construction paper around the Pringles can. This will be the trousers. Next, you’ll want to use scissors (or a trimmer) to cut the suspenders for the Minion’s trousers. 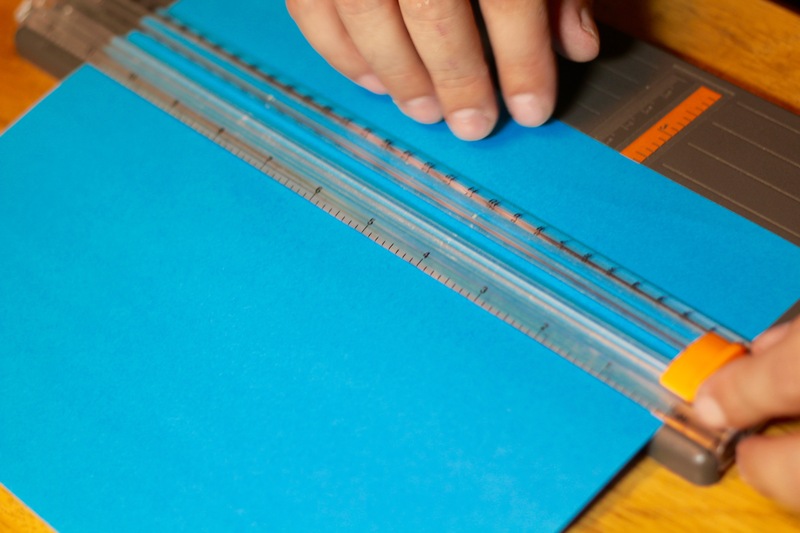 We just cut a long strip of blue construction paper and then cut it in half – giving us 2 strips – perfect for suspenders. 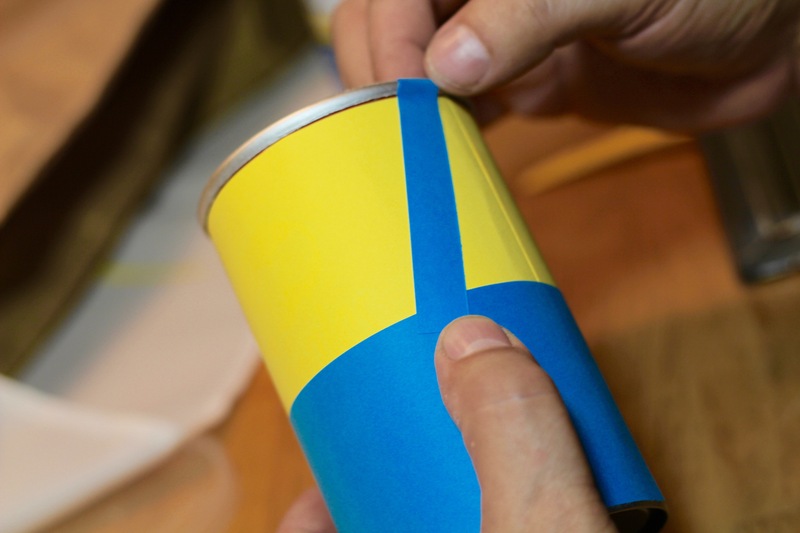 Glue or use spray adhesive to adhere the suspenders to the Pringles can. 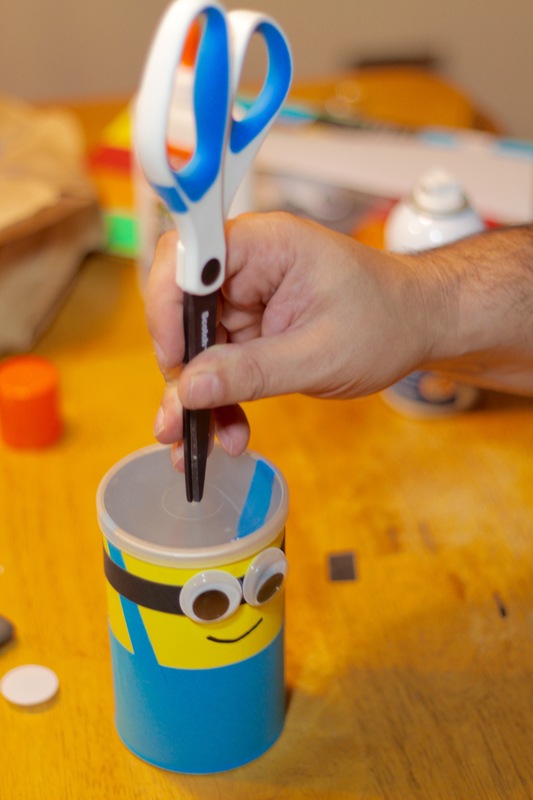 Next, you’ll want to cut a strip of black construction paper for the Minion’s glasses. You can use scissors or a trimmer for this. 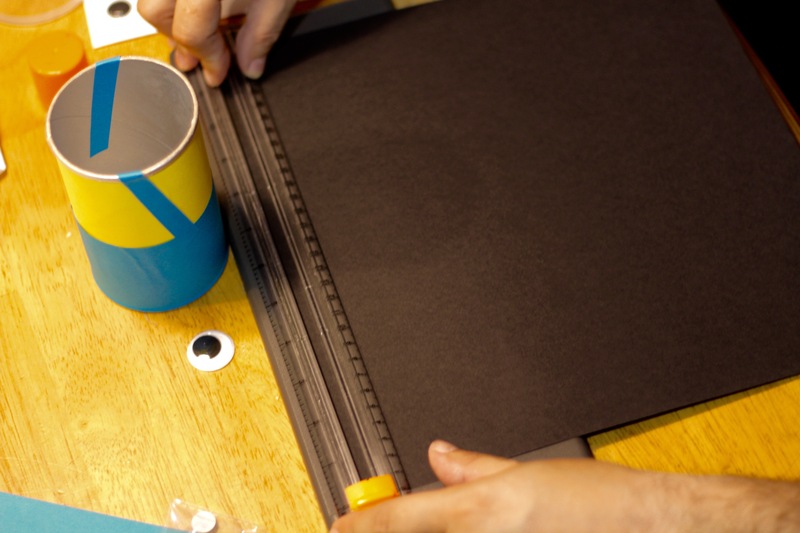 Use Spray Adhesive or White Glue to adhere the black glasses strip to the can. Trim off any excess amount. 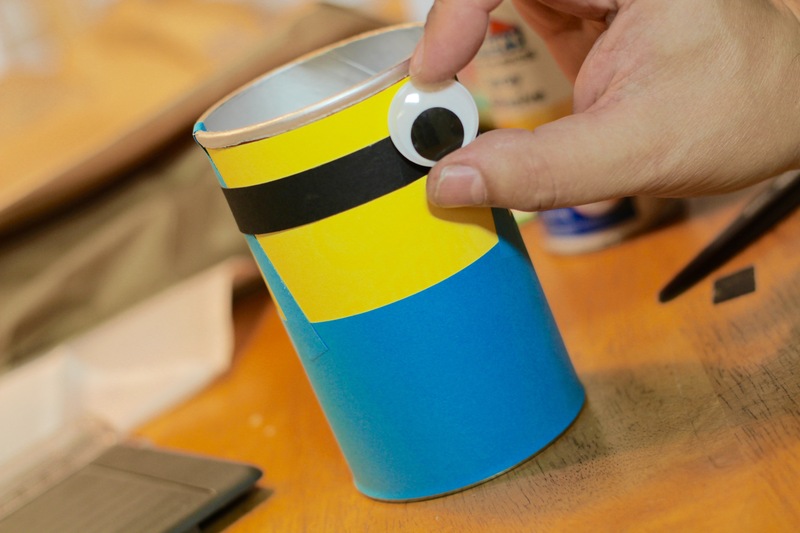 Use White Glue to adhere the google eyes to the can. You can use either one or two for the eyes, since there are one-eyed Minions and two-eyed Minions. 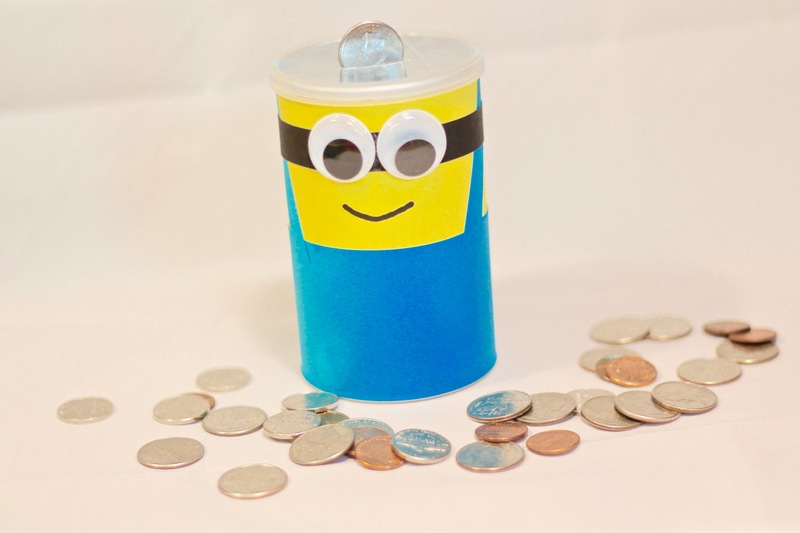 Your Minion Coin Bank is looking pretty awesome! Now, it’s time to draw a mouth. 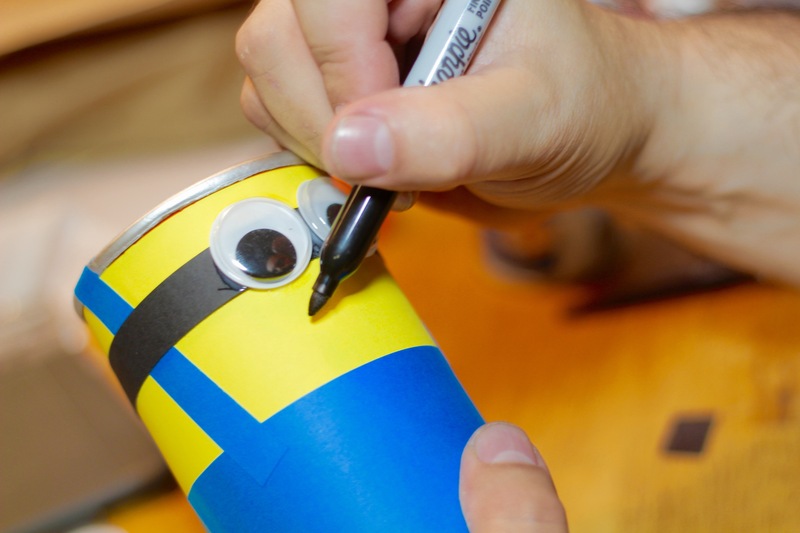 Use a black Sharpie pen to draw a smile on your Minion. What a happy Minion we have! Next, we’ll want to cut a hole in the lid. 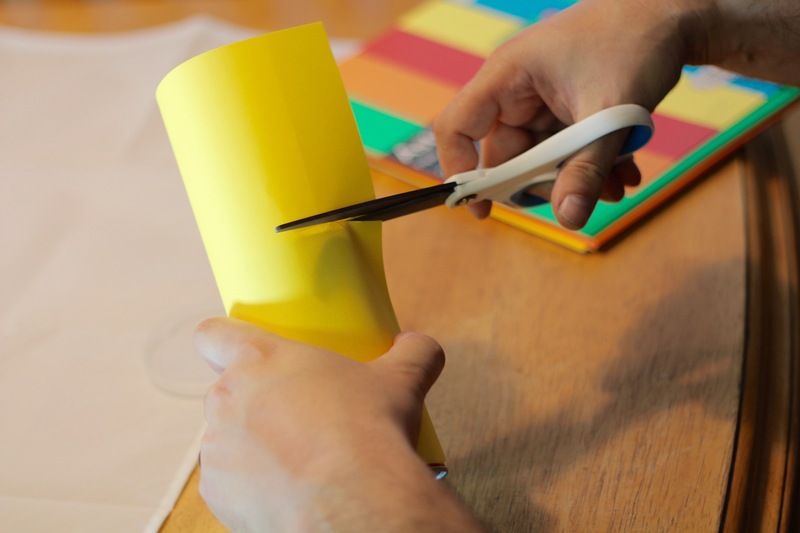 Use a pair of scissors to carefully cut a hole in the top. Make sure it’s big enough to fit your coins. 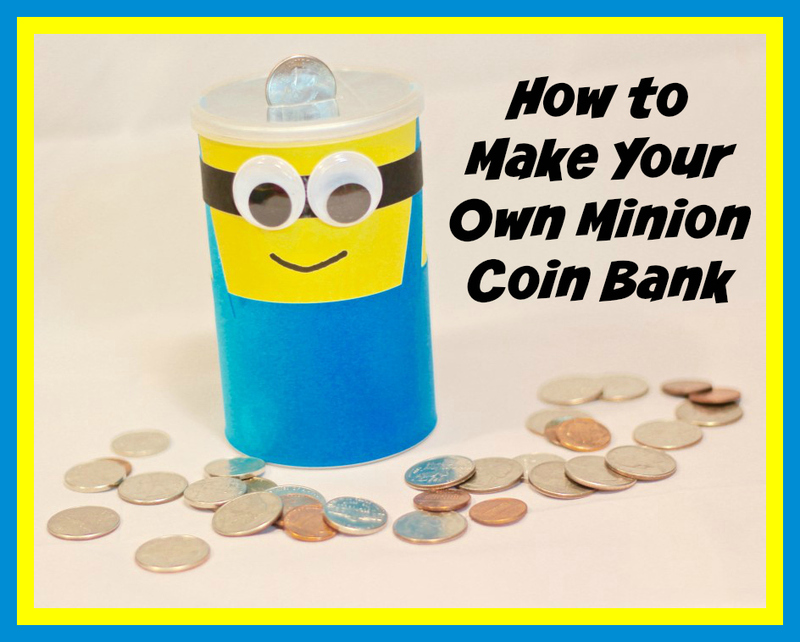 Now that your Minion Coin Bank is complete, it’s time to fill it up with coins! The Minion Movie is coming to theaters on July 10th! Be sure to get your tickets through Fandango and enjoy! 2 lucky winners on Daddledo will receive $50 in Fandango gift cards! Who will you be taking to see the Minion Movie in theaters? I will take my two daughters. Thanks! I want to take my son. I would like to take my niece and nephew to see the movie. I would take my brother and my nephew to see this movie. I will be taking my five year old son to see it! I’ll take my four-year-old – he loves going to movies because he gets to eat tons of junk food. 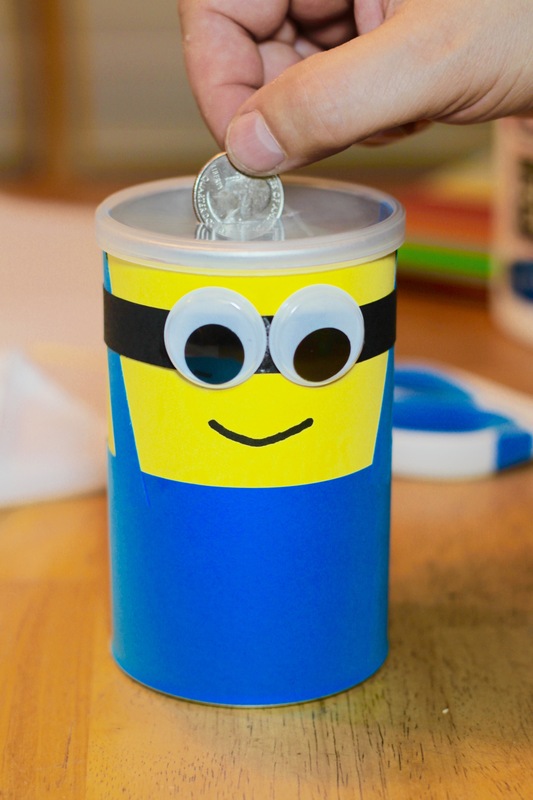 I will be taking my kids to see the new minion movie along with my niece and nephew too! My daughter says I’m not allowed to take her because her aunt is…I’ll still tag along! My youngest daughter is asking to go watch this. I would probably take her and a friend to see it. Thank you! I would take my two youngest daughters. I will be taking my nieces and nephew to this movie- they cannot wait! I will be taking my niece. I would take my older son and a friend. My daughter and my niece…they cannot wait! Thanks for the chance. I will be seeing it with my niece and boyfriend. I’d take my husband. We think their movies are hilarous! I would love to bring my little boy to see this movie. I’m taking my 6 & 3 year old with me to watch Minions, we can’t wait! I will take my son to see it. Such a cute craft! I love the Minions! I would definitely love to take my 3 nieces to see this! I would take my son and daughter. I would take my kids to go see this movie. They would love it. I’ll be seeing it with my Grandsons. I’ll take my 3 and 8 yr old son to see it. They can’t wait to see it. Oh I would love to take the whole family! Would be a GREAT movie night out! Carter loves the minions! I will take my husband and daughter to go see the Minions movie! I will take my three kids to see the new Minions Movie in theaters. I work with developmentally disabled adults. The guy I usually work with loves to see movie like this! I will take him. My nephew would love to see this with me!! I’ll take my best friend. I’ll take my soon to be 6 year old son. I will take my nephew to see it. I will take my daughter. My son turns 4 this Saturday. I have been trying to think of something to make for a goodie bag for all the kids who are coming to his party. This is perfect!! Thank you for sharing! I’m going to watch it with my 4 and 7 yoa nieces. Thanks. I’d like to take my husband, we think it looks hilarious! I will take my son and daughter to see this movie! I will take my granddaughter. I plan on taking my nephew to see movie. I want to take my nieces and nephews to see it! I will be taking my granddaughter to see The Minions. I will take my boyfriend! I can’t wait to see the Minions movie and he loves me enough to go see it with me! I will be taking my kids and my niece. I’d take my daughter to see it. She loves Minions! I’d take my two kids and husband with me. i would take my nephew. he wants to see it. I’ll be taking my niece. My nephew – he loves the minions! I would take my husband and my kids! I would take my youngest granddaughter and her friend to see this movie. I would take my kids to go see this movie. We’ll be taking the whole family. I am taking my husband and son and daughter to see the movie. We are taking our youngest son to see it. I’m planning on taking my oldest daughter. She keeps bringing it up, dropping hints that she wants to see it, lol. Id love to take my four older grand kids. They would love it. I’ll be taking my grandson to see the movie. 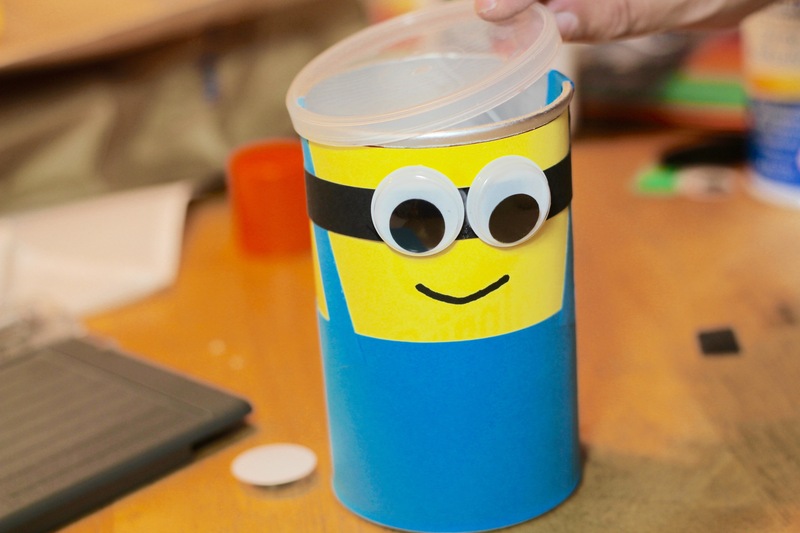 I would take my niece and nephew to see the Minion movie! Thank you!! My grandson Ian and I would go, he loves the minions. Thank You for the giveaway…we are taking my youngest daughter and her best friend to see Minions. I will take my fiance and my kids! My sons would go with me. i would love to take my two daughters with me and my husband to see the movie !! THE SUBSCRIBE FORM DOESN’T SHOW UP IN CHROME. Used Firefox and it showed up.